My husband Andy decided to put on a pink shirt, red tie, and wear my red zip-up fleece vest today. 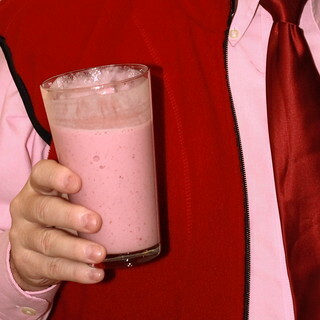 I made us a strawberry-banana smoothie. I figured a photo of Andy toasting the holiday with a pink smoothie in front of all of his pink and red would be cute. Unfortunately, he was in a hurry to go to work, so when I asked him to smile, his expression was frighteningly fake-looking. So I just cropped the photo down to the pink and red, and I'm sure Andy does join me in wishing one and all a very happy and healthy Valentine's Day-- even though he had to hurry off to work.